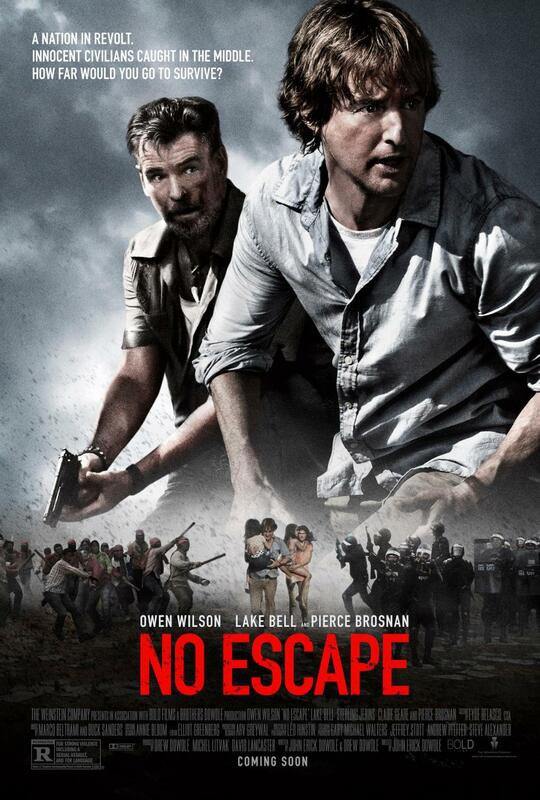 Cast: Owen Wilson, Pierce Brosnan, Lake Bell, Sterling Jerins. John E. Dowdle’s No Escape feels like a mash up of The Purge: Anarchy, The Warrior and Hostel. It’s a tense mess of a film that really hits all the worse clichés of the dangers abroad genre. Dowdle’s direction is fairly strong as he ratchets up the tension to insane levels particularly during the first half of the film. Sadly, there’s little to no characterization of any of the characters and only the thinnest and cheapest of explanation about the coup that sets off the action. Pierce Brosnan appears disappears, reappears and disappears for good from the movie remaining the most interesting character in the whole production. Owen Wilson and Lake Bell deliver solid work hitting all the panicked notes you can think of. They’re continually frazzled and on edge but seemingly have time for some family discussions regardless of whatever is going on. There’s logical plot holes left and right even as the film beats its message over your head with it literally spelled out for you. And then, just like that, it’s over since the escape route was conveniently close and far enough to keep the film rolling. If it makes you feel any better, he's not really an action start in this. Mostly they just play people way out of their depth.